Providing you the best range of hand grade stretch wrapping film and machine grade strech wrapping film with effective & timely delivery. Hand wrap film can be stretched up to 2 times or more than their original structure. The film is applied manually to the products and is available in thickness of 23 microns or lesser and more depending on the specification of the clients. It is commonly used to wrap products to prevent scratches, stains and contamination. Another important use of the film is that it ensures that the packed product remains intact within its package. 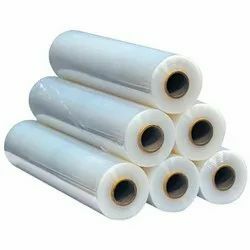 The advantage of using stretch film also lies in its most important feature of transparency, thus being able to view the product package, brand, specifications etc. Apart from its general usage, the most extensive use of this is highlighted while transporting and exporting products. Machine Grade Stretch film are designed for use with stretch wrap machines. Our machine stretch films are manufactured from high performance, high yield material. We supply a selection of machine pallet wrap film specifically for use with stretch wrap machines for high volume, continuous wrapping. Choose from machine pallet wrap rolls of 19, 23 and 29 micron thick wrap, with either a standard power pre-stretch for medium duty use or super power pre-stretch for heavy duty use. All have a core diameter of 76mm. 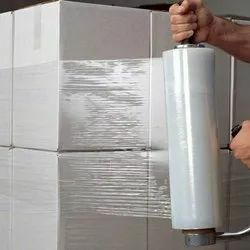 Looking for Stretch Wrapping Film ?